How Mulching can improve the health of your flower beds. Mulching is one of the simplest and most beneficial practices you can use in the garden. Mulch is a simple protective layer of material that is spread on top of the soil. 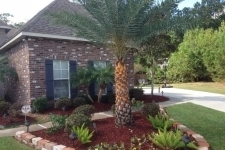 Mulches can either be organic — such as grass clippings, straw, bark chips, and similar materials — or inorganic — such as stones, brick chips, and plastic. Both organic and inorganic mulches have numerous benefits. Mulch may make a garden look tidy, but the work it does to improve the growing conditions for plants is what makes it most appealing. Those layers of bark or pine straw also improve soil texture, suppress weeds, and conserve water. In nature, the forest floor is covered by leaves, twigs, fruits, branches, and decomposing plants for much, if not all, of the year. With the help of animals, microbes, and seasonal weather changes, these decomposing materials create a litter layer that protects the soil from erosion and weather extremes. We spread mulch in our gardens to mimic this natural process.